Sure to get a few uncomfortable laughs from anyone who has ever been a teaching assistant for a less-than-pleasant professor, First Person Tutor is a simple but smart commentary on the uglier side of higher education. First Person Tutor probably isn't what you expect. This isn't a game that tutors players on any particular subject matter, nor does it teach players much about the fine art of tutoring others. Rather, this game is a biting satire on a world that most people probably don't know or care all that much about: the not-so-glamorous world of higher education. In particular, it's a game that will resonate most with those budding young academics known as graduate students. And for any of you who are graduate students, or who are friends and family of graduate students, this little game represents just a teensy taste of the bitterness, frustration, and anxiety that comes with trying to work your way up the ladder of the academy. Needless to say, this game hit me square in the feelings. Kids, this is why spell-check was invented. Use it! The conceit of the game is quite simple. You are the teaching assistant for a professor who spends more time policing his reputation on "The Face Book" than he does preparing for his courses. 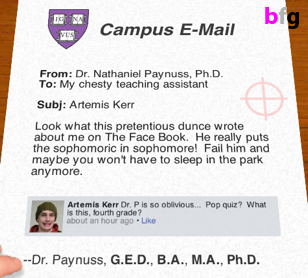 When students publicly complain about his questionable teaching abilities, Professor Paynuss insists that their grades suffer accordingly. However, never one to allow his markings to appear blatantly arbitrary, the professor makes his grader (you) do the all the dirty work. You must find as many errors as possible in each student's paper. The goal is to find enough mistakes to justify giving the student a failing grade. Charming, no? Of course, given the number of papers that you have to grade, you only have a very limited amount of time to spend on each one. The early stages give you a luxurious 30 seconds to grade each paper. Later stages give you even less time. The mechanics of the game fit well with the premise. Each level presents a new paper, and players have to skim it quickly for errors. 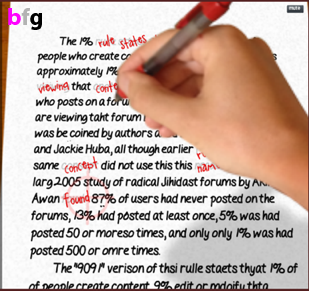 A simple click with the mouse brings down the full force of your mighty red pen, and points are deducted from the student's paper with each properly identified mistake. Dr. Paynuss will laugh gleefully at the end of the level if you've managed to reduce the student's final grade to an F or F-. Players' final scores are tallied in terms of their student debt. You start the game $200,000 in the hole. Each paper which is marked up to Dr. Paynuss's satisfaction chips away at that debt just a tiny bit. 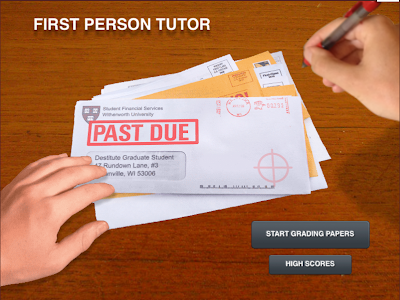 It definitely doesn't take a Ph.D. to recognize some of the satire involved in First Person Tutor, although the many different layers of criticism presented in this simple little game make it surprisingly deep. The jab at professors who forget to check their ego at the door when they enter the classroom is the most obvious of the game's criticisms, but I would also argue that skewering the egomaniacal professor is probably the least insightful criticism that First Person Tutor makes. More interesting, I think, is the way that the game captures some of the fundamental flaws in the structure of today's higher education system, including the factory-like nature of undergraduate instruction and the total lack of checks on the often exploitative nature of the relationship between graduate students and their mentor/patron/employers. In the game, grading undergraduate papers is an exercise in mechanical brutality. Rather than read the papers for content, the time constraints (as well as Dr Paynuss's dictum) force players to skim through the papers as quickly as possible. I couldn't tell you what a single paper I "read" while playing this game was about. And of course, the fact that you are merely looking for an excuse to assign a predetermined grade speaks critically of the subjectivity and whimsy that can go into grading papers. This is not to say that there aren't often good and reasonable justifications for the grades that students get. Usually there are. But it's still easy to find errors when you're looking for them, and that means that vindictive or biased graders can all to easily get away with bullying. It's a particularly grim view of grading, but it reveals the unpleasant truth that grading is a system easily subject to exploitation. It relies on the integrity and self-awareness of the grader to keep the system honest, and even they are subject to a variety of external pressures which can easily skew their ability to be objective. I'd laugh, but it's not really as farfetched as it seems. Another element which First Person Tutor highlights well is the positively feudal situation that is graduate school. The player, just like the typical graduate student, doesn't really have a choice about his/her role in arbitrarily marking down these papers. The player rejects the premise at the risk of ending the game; the graduate student rejects the premise at the risk of being unable to pay off crippling debts and ending his or her chance at an academic career by alienating an important faculty member. To continue to participate, you must not only silently endure Professor Paynuss's abusive emails, but you must allow yourself to be instrument that enables to carry out his ethically suspect plan. But the real rub is that the reward is so trivial. The amount of debt whittled off with each paper graded is miniscule. The sense of futility, degradation, and shame that comes with performing the unpleasant task is only amplified by seeing how little you gained from doing it. Failure, both to please the professor and to eliminate your debt, is inevitable. For a game that most players will probably spend a mere five to fifteen minutes playing, First Person Tutor successfully thrusts players right into the heart of the evils that can and do exist in modern higher education. Of course, not all higher education is like this. Not all faculty are like the Professor Paynuss. In fact, most are decidedly not like the Professor at all and I personally know a great many smart and inspired people working in our colleges and universities today. But even with good people working in academia, it's still deeply flawed as a system and has few checks in place to stop the kind of abuse and exploitation which First Person Tutor depicts. Higher education at both graduate and undergraduate levels relies solely on the abilities and good intentions of each individual faculty member in order to work as intended. And when professors shirk that responsibility, the abuse trickles all the way down. It's a cynical portrayal of academia's most unflattering side, but in my opinion, First Person Tutor does a great job of mirroring through its gameplay some of the critical problems which face modern education.